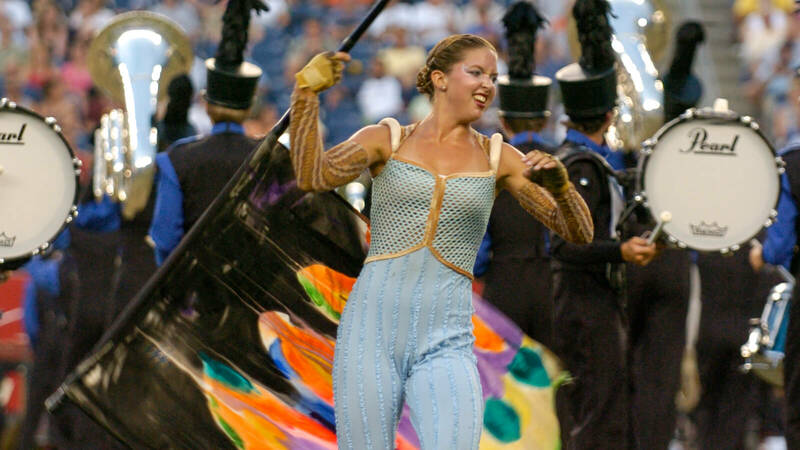 The 2005 Drum Corps International World Championships returned to Foxboro, Massachusetts, at the site where the 1994 DCI Finals had been held. During those intervening years, Foxboro Stadium had been torn down and replaced by the larger Gillette Stadium, located right next door. Major changes to the activity also occurred during that time, including the advent of any-key brass in 2000 and the legalization of amplification in 2004. On a day that saw the temperature and oppressive heat index break a 101-year-old record, The Cadets took the World Championship title by scoring 99.150, tying the record high score earned by The Cavaliers in 2002. The Cavaliers placed second while Phantom Regiment placed in the top three for the first time since winning the title in 1996. Blue Devils took fourth, finishing out of the top three for the first time since 1993. Blue Knights finished in 10th place with “A Midsummer Knight’s Dream,” comprised mostly of original music composed by percussion arranger Mike Nevin. Brass arranger Russ Newbury took Nevin’s condensed score and expanded it for the horn line, occasionally changing the keys as he saw fit. 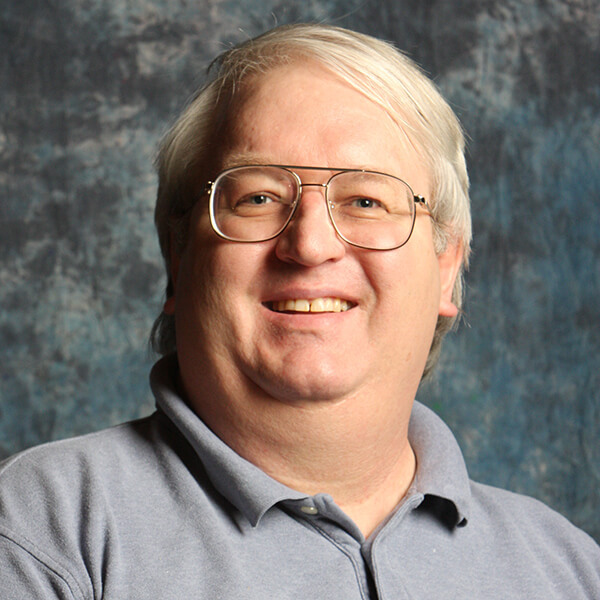 Pat Amann also contributed to the percussion book. Conceived to share the joyful emotions of marching a summer in a drum corps, the production did not forget about the hard work of rehearsals and warm-ups that lead to performances. In pre-season show planning sessions, the staff insisted that the camaraderie enjoyed by members of a corps should be the overwhelming feature of the show. Conceptually, the show took place in “Anywhere, USA,” the sounds of drum corps permeating a hot summer afternoon. Promotional material for the 2005 corps stated, “None of us will ever forget the first great horn line we heard from across some distant field, the impact of a rockin' drum line, or the unforgettable artistry of the great color guards.” Perhaps unexpectedly, there were no props or sets utilized, with music and choreography relied upon to express the theme. A variety of colorful hand-painted flags provided a unifying visual motif throughout, something for which the corps had long been known. Originally, the show concept had the drum line at the front of the field going through a warm-up sequence in preparation for the performance to follow, with the brass section further backfield doing the same. As the production developed over the summer, the horns and drums eventually started the show while gathered backfield in two long backward-facing arcs while the color guard members filled in the center. To kick off the production, the brass section played a warm-up chorale, still facing backfield, followed by the opening sounds of chimes that evoked an alarm clock. The first musical selection, untitled as were the rest of the movements, evolved into a fanfare meant to create a sense of awakening. The horns and drums turned to the front in a drill form re-creating what had been seen earlier, in effect flipping the audience around 180 degrees without anyone realizing what had really happened. The staff referred to the second movement as “the discipline theme,” portraying the hard work and repetition that goes into constructing, rehearsing, and perfecting a show. This segment segued directly out of the opening fanfare and featured more traditional symmetrical drill formations, finishing with a company front. An ominous brass interlude, rather dark in character, led into a jazzy segment filled with high-note playing trumpets that provided a release of tension. Next came a “drum battle” sequence, with the snares, tenors, and bass drums trying to outdo each other. Intensity built to a rhythmic, powerful end as the horn players stretched out on the field, spread-eagled in a Maltese cross formation. Previously heard melodic themes were recapped between the end of the ballad and the end of the show, leading to a powerful ending. The color guard members spun their equipment furiously as brass players offered up whatever final gasps their lips could muster, while fast rhythms took drummers to the edge of their hands giving out. 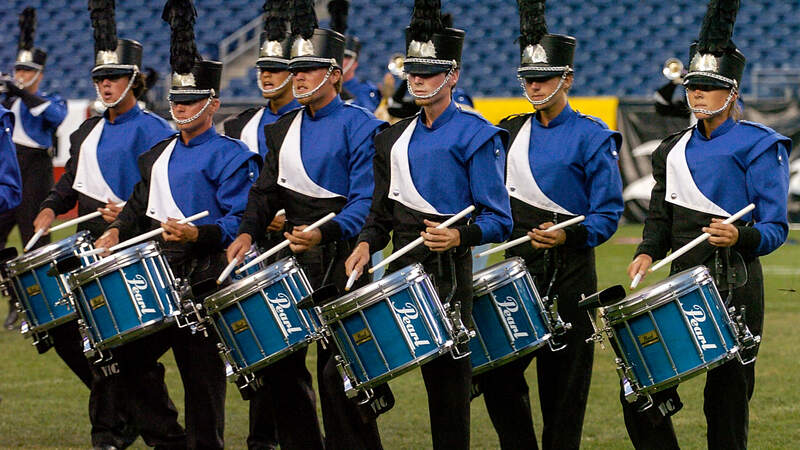 The final moments of the show projected a type of old-school drum corps remembered by longtime fans, fully relishing the season’s final summer (k)night.